Emergency service leaders, city service directors, elected officials and community partners ‘raced’ to Cote Saint-Luc City Hall’s Emergency Operations Centre Thursday morning for a mock rail disaster. 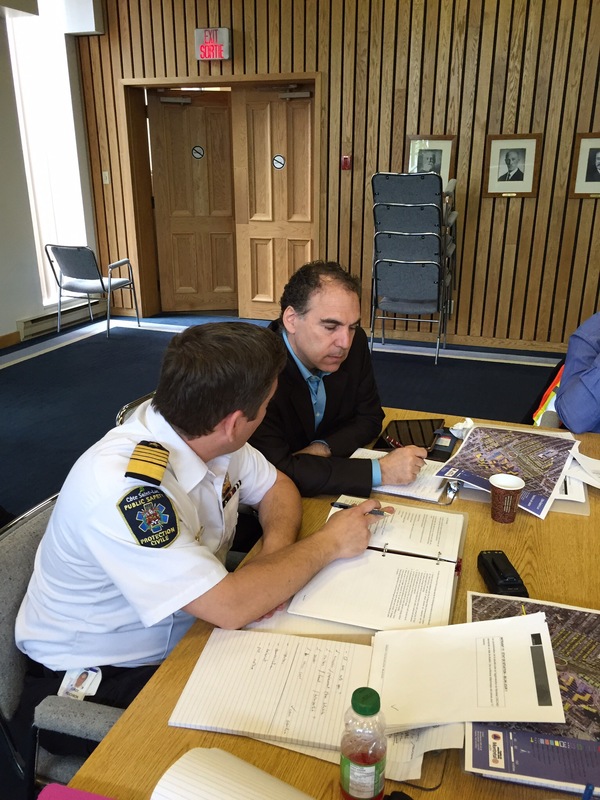 The exercise was coordinated by Public Safety Director Jordy Reichson in conjunction with Montreal Agglomeration’s Public Safety Centre. 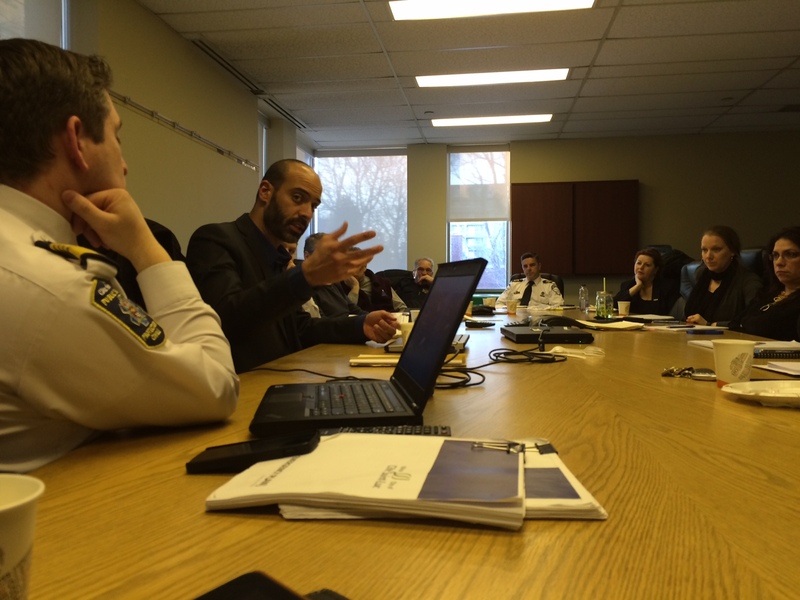 The live action exercise included Montreal agglomeration police and fire services, Urgences Santé ambulance services, CP Police, West-Central Montreal Health, Federation CJA’s community security branch along with all services in the city of CSL. The scenario involved an overnight train derailment that resulted in a fire and explosion, just east of the Westminster underpass, affecting 250 residents requiring immediate evacuation. Water and electricity was cut off. City personnel established an evacuation centre at the aquatic and community centre on Parkhaven at Mackle. Reichson gave orders to all service directors to huddle and coordinate with their first responders and personnel. As city councillor responsible for emergency preparedness I can attest that it is evident why CSL is renowned for its level of readiness. The ongoing training, testing and preparing are well worth the investment in time and resources. 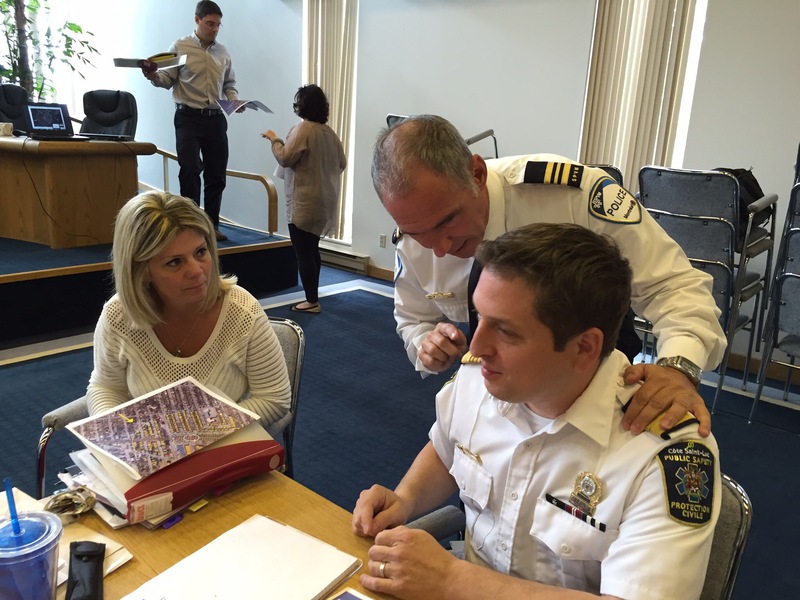 Police Commander Jean O’Malley confers with Public Safety Director Jordy Reichson. Executive Assistant Tammy McEwan keeps tabs on all decisions. In this mock scenario I served as official spokesperson for the city in partnership with Montreal Mayor Denis Coderre, and neighboring municipalities and boroughs. A mock press conference was set up to inform our residents. Several issues arose for the members of the Emergency Operations Centre to deal with on an urgent basis including diminished air quality, wind direction, sheltering of animals, providing kosher and non-kosher food, evacuation of mobility reduced residents and babies, registering residents willing to take in evacuees, distribution of drinking water and more. Participants dealt with a spreading power outage affecting the whole city. Traffic lights were out. Expectations were two days to restore all to normal. The three hour scenario demonstrated the participant’s ease in dealing with unraveling urgent situations and in collaborating around the table to ensure the safety of our residents. Discussions, swinging back and forth effortlessly in French and English, flowed smoothly and in a spirit if great cooperation. 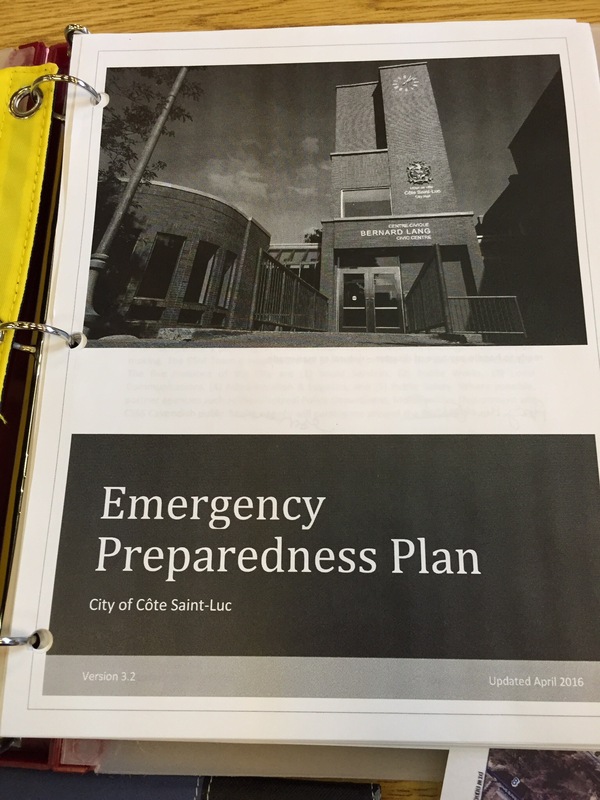 Cote Saint-Luc residents can take pride in knowing that their emergency, city and community services along with mayor and councillors hold these exercises from time to time and place such a high priority in testing their skills and readiness. Through these exercises improvements and adjustments can be made, professional skills developed and relationships enhanced to be well prepared for the real deal. On behalf of our residents, thank you to our dedicated leaders around the tabletop mock disaster. Your commitment to emergency services and to our residents and community is exemplary and greatly appreciated. Thank you to Sid-Ali Talbi of Centre de sécurité civile de Montréal and CSL Public Safety Chief Philippe Chateauvert and kudos to Jordy Reichson for his leadership in orchestrating a successful demonstration and return to normalcy for our city. 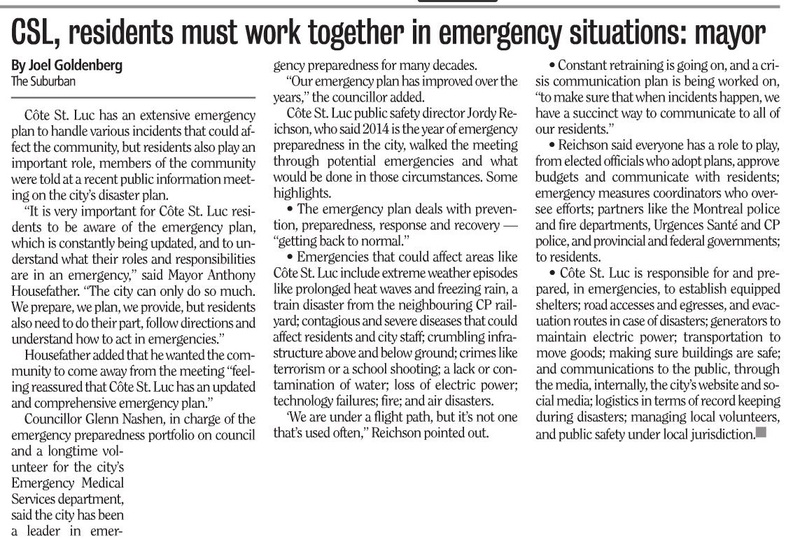 Councillor Ruth Kovac and I have been involved in emergency preparedness in Cote Saint-Luc for 36 years. I was involved in EMO in the 1987 floods and we both participated in leading city services in the 1998 Ice Storm and in preparation for Y2K. We’ve taken part in many exercises over the years and we were very impressed in how these leaders came together to deal with a sudden, life-threatening crisis in a calm and professional manner. We’re in good hands in Cote Saint-Luc! For more information on emergency preparedness in Cote Saint-Luc and to learn what you can do to better prepare your own family please visit the CSL Emergency Preparedness page here or GetPrepared.ca. Just because we live in one of the most peaceful communities in the Montreal area doesn’t mean we’re not thinking about what can go horribly wrong at any moment. 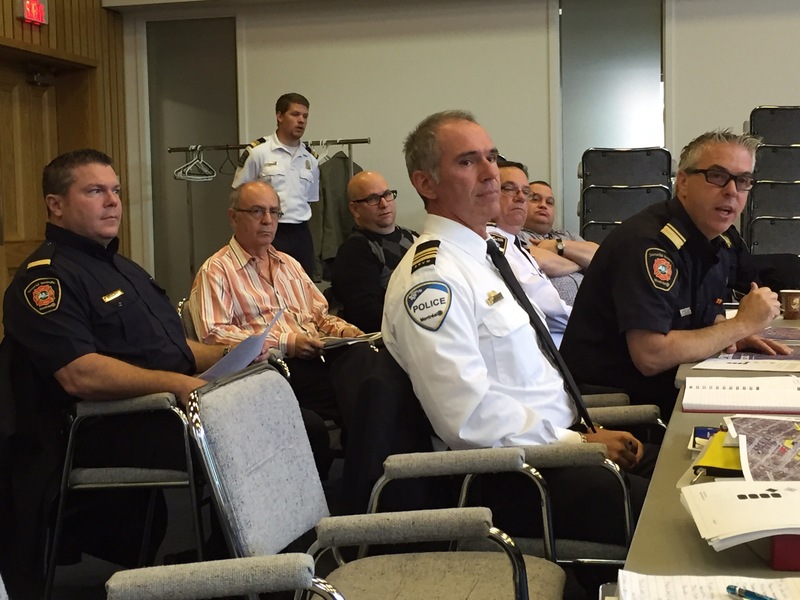 And for this reason some very specialized people gathered at Cote Saint-Luc city hall earlier this week to discuss disasters, large and small, natural and man-made. 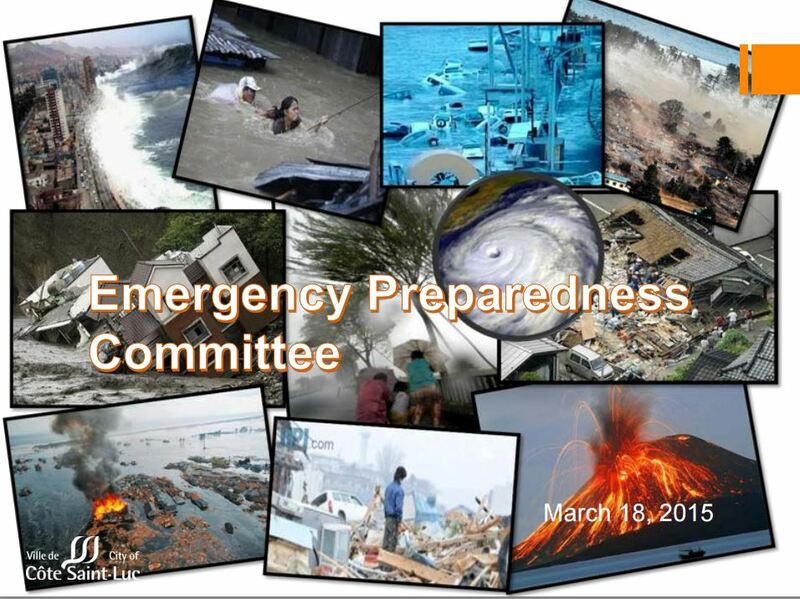 As the chairman of the Emergency Preparedness Committee I ensure that we bring experts around the table each year to review and update our emergency plan and that we test the plan with our staff and volunteers and keep our residents informed and aware. Last year CSL City Council made Emergency Preparedness a major priority for 2014. We held a public information meeting about emergency preparedness. We dedicated an entire issue of the CSL Courier to this important topic and we launched the CSL Alert Mass Notification System. CSL Alert allows you to opt-in to receive notifications via phone call, text message, e-mail and more based on locations you care about. You can choose to receive notifications about events that may affect your home, workplace, family’s schools and more. Visit http://www.cotesaintluc.org/Alert to learn more. 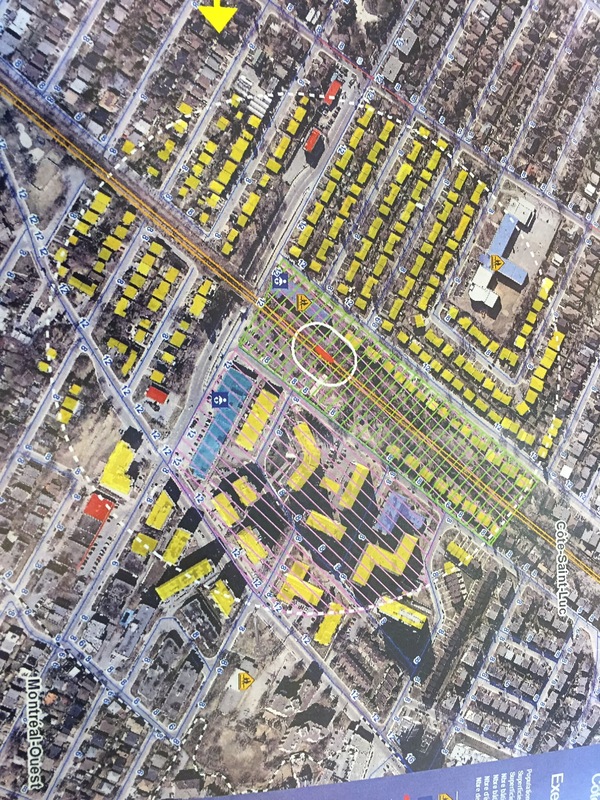 The City of Côte Saint-Luc will unveil a summary of its disaster plan to the public on Monday, September 15 at 8pm at City Hall, 5801 Cavendish Blvd. Councillor Glenn J. Nashen, the council member responsible for emergency preparedness will also discuss how residents can prepare for the first 72 hours of an emergency. For more information on how to prepare for an emergency, visit CoteSaintLuc.org/EmergencyPreparedness. Sunny, warm days are finally here after a wicked winter and a stressful provincial election. Let the good times roll but please drive carefully and look out for kids playing and cycling. vCOP continues to grow as our volunteer corps approaches 80 members, allowing for more patrols day and night, and more folks ready to help when disaster strikes. Our crews are also trained by the Fire Department to inspect your smoke detectors, which are required by law. Please invite them in when they ring your doorbell for a free inspection. And consider joining us by visiting the vCOP website at CoteSaintLuc.org/vCOP. 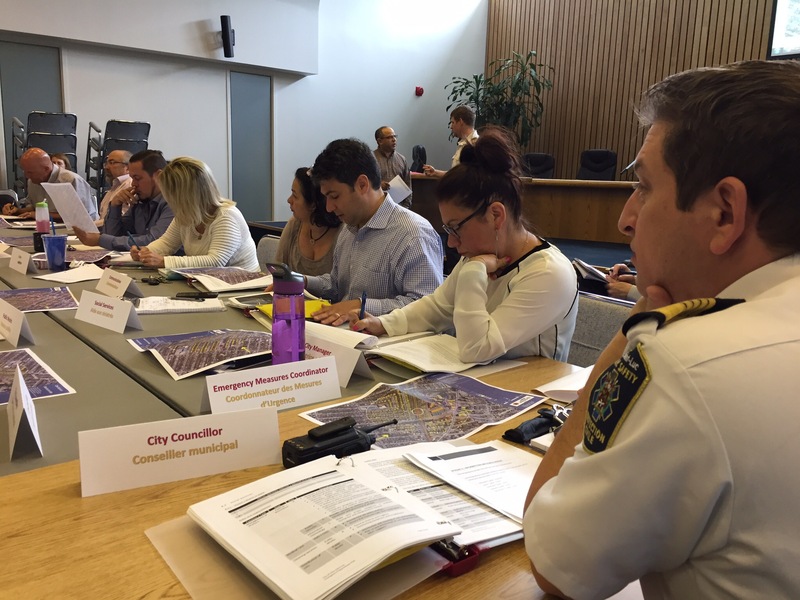 This year City Council is focusing efforts on EP and disaster planning. Already a leader in these issues, we are upgrading plans, training staff and volunteers, and involving and educating you. You will soon be able to sign up for emergency alerts by phone and email. Watch the local papers and my blog for important updates over the coming months. The Parkhaven Courtyard Townhouse project is in full swing. The old Griffith McConnell infirmary is demolished and there is much activity in preparation for the construction of 50 townhouses. The long term prospects for this site are very positive. Welcome to several new residents who have moved in to their beautiful new homes on Kellert (between Kildare and Mackle), now part of District 6. Please be sure to subscribe to my blog or follow me on Facebook or Twitter. My postings are an unparalleled means of keeping you informed on local issues, breaking news, opinion, public safety information and news clippings from Cote Saint-Luc.